I’ve searched this over and over but can’t find if anyone has solved this issue. My ‘08 plate has the sloppiest side-to-side movement I’ve ever felt on a car. It’s horrible. I recently replaced the upper bearing shell, or whatever it’s called, which has made shifts feel a bit more precise when the gear engages but hasn’t made any difference to the side to side slopfest at all. I also realigned the gears as per the DIY guides on here which again made no difference. I’m not sure a 42dd bushing kit will help as this appears to be localised to the actual gearstick mechanism. If it will I’m all ears, but it appears to either be the small white bushing to the right of the gear-lever itself (the one that goes through the metal slot) which looks like it will be a pig to change, or it’s coming from play in the mechanism just in front of the gear lever, the sheathed pivot arrangement (no idea what this is called) which looks even worse to address. I replaced my gear box!!!! Hi, the side to side movement slop can be in a couple of places. It's a bit expensive for a bit of plastic, and the customs charge is a joke (£15), but its a nice snug fit compared to the original. They are real easy to fix, off with the plastic engine cover, battery and cover, pop off the gear cables, pull out the pin for the gear relay lever and push out. Diesel geek has a few how to video on his website. I’ve worked out where the issue is. Now I need your help fixing it. 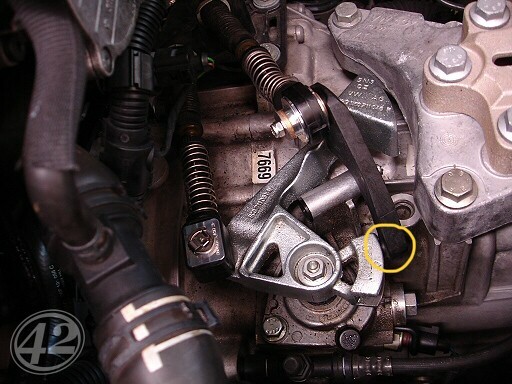 I can’t get a good look to see how this part connects to the gearbox, it was getting dark so I will have to have a better view tomorrow and see if I can work it out. From what I can see there appears to be a square plastic bushing holding this in which is obviously worn. Do I need to replace this plastic bracket or is there something else I should try? Anyone know? No need to replace the entire linkage, just the little white slider that attaches, Dieselgeek.com make a tighter tolerance slider than the OEM (see link in previous post), just bear in mind there are 2 versions to the slider, one for the metal linkage (pre 2008) GTIs and one for plastic linkages (post 2008), just have a good look with a torch to see what version you have. Awesome, thanks will check this out. 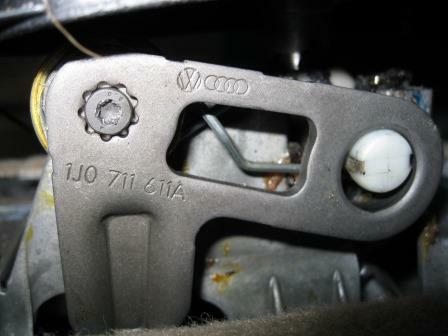 Is there a standard VW replacement part for this or is it a case of whole new linkage? If there is, it might be more cost efficient to replace with brand new VW albeit it won’t be quite as snug. I’ve got hold of a new OEM slider and fitted along with the 42DD bushing kit. The feel is much improved and gear selection is much more precise. However, there is still side to side slop and a general unweighted, vague feeling when changing, before the gear is selected. This is much worse in the side to side shift which has a total lack of resistance. It looks like the OEM plastic slider still has a bit of play in the bracket so I’m considering ordering the tighter dieselgeek slider along with an S3 short shift which should improve things. The cost of the slider is putting me off though! But that small 1mm gap is definitely contributing to the gearshift slop even with a new part. Otherwise I’m trying to think of ways to add weight or tension to the side to side selection, doesn’t appear to be much out there in the way of a solution so far. After I changed the diesel geek slider and used the metal cable end bushes it improved things quite a bit, but yes I too still have a bit of play in the side to side. For me I missed a trick and didnt order the first gear getter, from diesel geek. When I popped off the gear stick surround and down the left hand side (by feel) the bush that goes into the L shaped lever has disintegrated leading to slop. And maybe there is a tiny bit of play in the play in the bush in the gear stick shaft. I dont think there is much else (except the cable ends under the gear stick box) but that is and exhaust off drop the box through the floor job.